(On Top of the World) MUVE and our local elementary school joined forces to battle low attendance among it's students. Our creative solution was to energize the students twice a week right before academics. We lead a dance party with dancing games, this event is for every grade and all abilities. We celebrate creativity, cooperation, working together and having fun with new people. Two groups, each with 100+ students and teachers. The results have been remarkable. 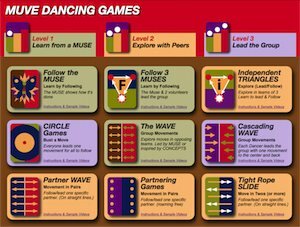 This MUVE Dancing Game is called the "Muse Circle." 9 muses volunteered as lead dancers. There job is to create a dance movement that the entire group will follow. When the Caller's signal, the Muses rotate and a new Muse is in the center, ready to lead the group. With each rotation a new combination of dancers explore creative dance together.